Let me interrupt the stream of presentations here with a quick interlude telling you about how cool Hong Kong is. I am currently sitting here at a cafe writing this on my newest toy – an Asus eeepc which I bought for about 200 GBP the day before yesterday. I like Hong Kong to bits, there is hardly any city that is as efficient and easily accessible. People are very proficient in English and all signs are bilingual. On the other hand you can get Bladerunner moments when you leave the neon corners and end up in a local side street with interesting food and products you have no clue about. It is easy and cheap to get a cab should you get lost but in general there is hardly ever any need to. The underground (MTR) is easy to find with signs pointing to the nearest stations all over the shop and inside it you can see on the trains which station you came from, which direction you go and which other lines connect on an illuminated map. The easiest way to pay for the tube is an octopus card, which is a prepaid card you get for about 10 GBP with 3 pound being a deposit you can redeem on your last day should you want to return the card. This card also enables you to buy things in shops, which can come in handy should you not want to collect a lot of change :-). 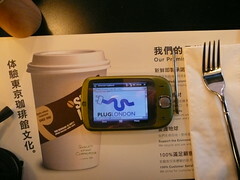 Connectivity is nuts, you’ll find free wireless in nearly every cafe or shopping centre (and boy are there a lot around here) and if you want to be 100% sure you can sign up for a 30 day access with PCCW, a massive provider who has hotspots in nearly every corner of the city. Mobile coverage is even on the underground which means you hear people happily chatting away covering their mouth and half the mobile with their hands. There are cashpoints on nearly every train station with no fees but the UK bank ones (cheers, Barclays) and you can pay with Visa almost everywhere without getting any strange looks. You are also never far from clean and freely available public convenience places should you need to wash your hands or comparable tasks.